25 cm xi, 155 p. : ill. Drama is increasingly being recognised as a valuable pedagogy for language learning as it can harness children`s imaginations and stimulate their desire to communicate. Second Learning Language through Drama draws on current theories of additional and foreign language learning and illustrates through practical case studies how drama can be used to support the four key skills of listening, speaking, reading and writing. 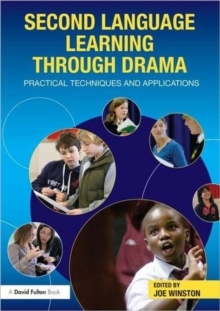 Drawing on the work of an international group of practitioners who are all highly experienced in using drama for the purpose of second language learning, the book clearly explains key drama conventions and strategies and outlines the innovative ways they have been used to create enjoyable and stimulating classroom activities that allow for multiple ways of learning. Throughout the book the emphasis is on making language learning accessible and relevant to children and young people through creative, physically active and playful approaches. The strategies described are all highly flexible and readily adaptable to different teaching contexts. Specific themes include:Using stories and drama to motivate learners at all levelsDrama, language learning and identity Assessment opportunities through process dramaIssues of language learning and cultural empowermentDigital storytellingFilm & drama aesthetics Second Language Learning through Drama will be of great interest to those studying on undergraduate and postgraduate courses and will serve as a highly valuable text to practitioners looking to incorporate the approaches described into their lessons and classroom activities.